Bizarre though it may seem, there are a number of churches in Africa that set a lot of store by what the CofE leadership say. While it's simple to say that Welby should simply have the courage of his convictions to say what he thinks, one has to remember that he is appointed as the primate of all churches in the Anglican communion. A remark from him may very well not have any direct effect on those who actually perpetrate massacres of the type, the words of their local church leaders can have an extremely profound effect on such activity, and they will have a line fed down to them by their superiors who may react very poorly to a pro-gay-marriage line from the Anglican leadership. Welby is dancing on the head of a pin - trying to remain relevant to the dwindling congregations on home soil, while trying not to anger Anglican churches in Africa to the extent that they will incite homophobic violence. In a sense, it's an impossible position, so it's not so surprising that he's making a pigs ear of it. From my time spent working for the international wing of another 'mother church' (the Church of Scotland - mother church to a great many of Presbyterian congregations from Southern Africa through Israel, India to northern China), it was staggering how much store these churches set by so much as the content of a newsletter that I produced - I had to field more than one biblically angry international call due to the tiniest nuance of a piece of prosaic puffery. It's a preposterous situation really, that the Primates of such predominantly African denominations should still be bumbling British theologists. What's worse though is that the policy position driven by these African situations winds up influencing UK law through the presence of clergy in our parliament. Better for all concerned, I would suggest, if the CofE were completely divorced from the state; that way they could fully set their own position out to placate the African churches and drag them to a more enlightened position at a pace that hey will tolerate, while at the same time being compelled by UK law to act in a more liberal fashion with their 'hands tied' and their theological integrity intact. Very interesting points. I knew the Archbishop of Canterbury had some vague authority over the African churches in his capacity as head of the Anglican communion, but I didn't realise they took it so seriously. And yes, I entirely agree the C of E should be cut loose from the state. I don't think it's any excuse for Welby's remarks though. If he said he didn't want to endorse gay marriage because it would upset the African churches, then fine. But he didn't say that. He said (or at least strongly implied) if the C of E endorsed gay marriage, Christians would be killed as a direct result. He was explicitly referring to anti-Christian violence, not homophobic violence. The African churches are already inciting homophobic violence, eg. by backing anti-gay laws in Uganda. Personally I would have moral difficulty with being the figurehead of such a group, but that's Welby's problem, not mine. 1) Back gay marriage for the C of E, and accept the African churches will be angry, maybe become more viciously anti-gay than they already are, and potentially leave the Anglican communion. 2) Do not back gay marriage, in part because he values Church unity (such as it is). He has every right to choose (2), but he should at least stand up and take responsibility for it. He can discuss his reasons, or if he feels that would be impolitic, he can keep his mouth shut. That's not heroic behaviour, it's the minimum I'd expect from the head of any large organisation. 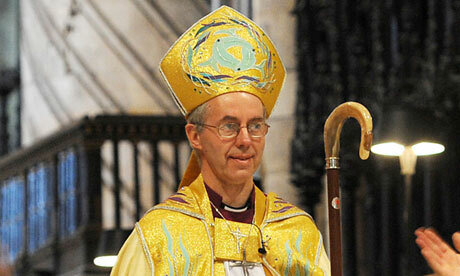 I'm not demanding the C of E endorse gay marriage. It would be nice if they did, but I'm not part of their church and their doctrine isn't really my business. However, pretending they were forced to reject gay marriage by the threat of anti-Christian violence is just incredibly stupid and offensive. 4) He thinks gay marriage is right, but doesn't want to endorse it at this time, because it would further disrupt the unity of the worldwide Anglican Church. He doesn't want to admit this out loud and thinks talking about anti-Christian massacres is a good distraction. For practical purposes, this is very similar to (3).